So more or less coincidentally, within a week I got to see two new movies about the early 1980s that both dealt with the issue of HIV/AIDS: Ryan Murphy’s The Normal Heart (HBO, 2014) and Matthew Warchus/Stephen Beresford’s Pride (Calamity Films, 2014). When I say that I’m here to discuss one of them mostly favorably (Pride) and one of them less so (The Normal Heart), I’m not doing this primarily to draw a comparison between British and American filmmaking, although I believe they can also serve as fairly good examples for a specific type of national cinema/television. 1. The first issue, this movie has in common with another very recent film I really wanted to like but didn’t: Kill the Messenger (2014) with Jeremy Renner. The biggest problem I have with both of these movies is that they take a topic of immense political importance (the AIDS crisis in one case, the CIA’s implication in the crack epidemic in the other), and turn it into a movie revolving around a self-righteous jerk feeling misunderstood by the rest of the world. I don’t blame Mark Ruffalo and Jeremy Renner for this, they both delivered excellent performances, but frankly I did not go watch Kill the Messenger or The Normal Heart just to see how pretty these two guys look when they are angry: I can get that watching The Avengers. Of course, this is also not a flaw limited to these two movies, quite the contrary – and that’s where the question of national cinema comes in: Rather I believe they are symptomatic for a specific type of US-American political-historical movie that usually makes me feel like I’m looking for a monograph on the Civil War and getting stuck with a cheesy biopic based on Abraham Lincoln’s personal diaries. 2. The second problem I had with the The Normal Heart is the way it manipulates the spectator’s emotions to a point where they cannot help but feel almost resentful toward the movie. This one, I blame on Ryan Murphy, who already managed to turn Glee from the show I couldn’t wait to watch every week to the show that made me feel slightly queasy every time I tuned in. Like the later seasons of Glee, The Normal Heart doesn’t tell a well-paced, coherent story that draws you in, or makes you sympathize with the characters: Instead, it seems like a stringing together of dramatic speeches and tear-jerking moments. What merely annoys me in regard to Glee, however, I find highly problematic in a movie about the early years of the AIDS crisis. This is the story of a global tragedy, but instead of letting the events speak for themselves, Murphy bombards the viewers with extreme close-ups and pathos, as if that was the only way to make them understand how they are supposed to react. Pride, in many ways, is the complete opposite of this. I feel the greatest virtue of this movie is that it manages to be heartbreaking all the while remaining a comedy that’s funny and entertaining and positive; and that it leaves an impact without ever dwelling on anything for too long, neither on one particular character, nor one one personal tragedy, or even on one single political issue. 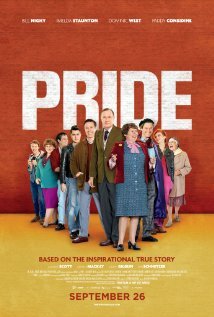 In fact, Pride is not even really a movie about HIV/AIDS: The conflicts it focuses on primarily are the British miners’ strike and the effects of Thatcherism on the one hand, and the struggles of the gay community on the other. And yet, the threat of HIV is present throughout the movie without ever taking center stage, and the movie manages to convey the devastating consequences of the disease in brief moments and tiny details: for instance a brief scene in which Gethin, in the hospital after a gay-bashing, begs his friend Sian to look after his HIV-positive boyfriend Jonathan in his absence, because “he needs to eat properly;” or the combination of seeing a bright, triumphant Mark Ashton march in the Pride parade 1985 with the knowledge that he will be dead only two years later. All the individual stories and fates this movie tells resonate with the viewer in a very intimate way, despite the fact that no individual character really steals the show: Pride is truly an ensemble film that focuses much more on group dynamics and interpersonal relationships than on one hero or main protagonist – and this seems an adequate and appropriate approach for a movie about political movements and their solidarity among each other. Now, Pride is not without its flaws. Especially the cut, I feel, could have been a bit more carefully done. I got the sense that the filmmakers were so concerned with avoiding sentimentality or wallowing in emotional moments that they overdid it at times and ended up cutting too quickly, thus depriving the spectators of some opportunities to really savor the excellent acting of the entire cast. I also felt that the gender imbalance within the group of “Lesbians and Gays Support the Miners” was glossed over too quickly: the gay men’s easy dismissal of the lesbian women’s concerns about the democratic process within the group was the only time I felt the movie made light of a serious issue in an inappropriate way. 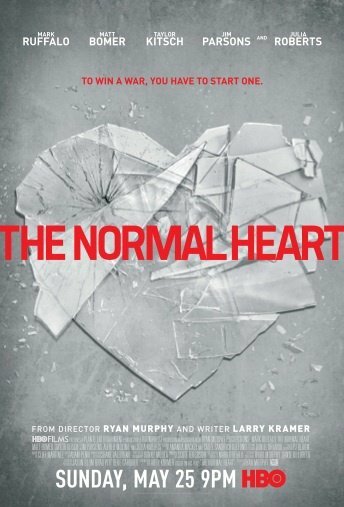 In conclusion: The Normal Heart made me cry, a lot. Pride made me laugh, and cry a little, but most importantly, it’s made me do online research on 1980s politics for more than a week. This entry was posted in Uncategorized and tagged british pop culture, cinema, LGBT, us pop culture. Bookmark the permalink.